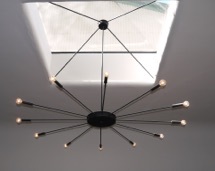 Panache Lighting can fabricate lights of your design. We can do many processes ourselves, plus we have a great network of other craftspeople to work with as needed. Here’s another project: A client wanted some simple old lights for her cabin; out of our collection of various old parts, we put these together for her. 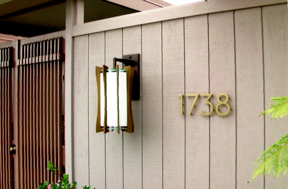 Here’s an example of our work: These large sconces were designed by Sara Terrell Designs, interior designer, for a mid-century style house in the East Bay. They are made of a large white glass cylinder held by numerous wooden brackets, with caps of acrylic, mounted on a brass arm and backplate. The wooden brackets are actually comprised partly of machined brass parts, to provide the strength needed to hold the pieces together. 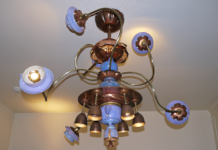 We fabricated the brass parts and backplate and patinated it to the designer’s specifications. We made four of these sconces, which measure 12” wide 24” tall and have a 14” projection. We make these lamps for a local company, Tokens and Icons, who sells their sports nostalgia products through various catalogs. The baseball lamp is currently in the Smithsonian’s gift catalog. Open hours: 1-6 pm Tuesday through Friday. Other hours by appointment. Please call 510-204-9375 to make an appointment for times other than our open hours.